The kiddos spent the night last night and are sleeping upstairs. That means Auntie gets to enjoy coffee, TV and knitting. Except this morning is crochet. I’m working on a tree skirt pattern from my local yarn shop Fibre Space that mimics a pricey Anthropologie version in stores a couple of seasons ago. 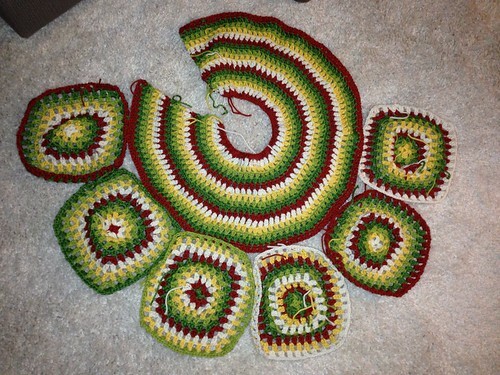 Here are some of the granny squares and the circular base that will go around our tree. Not blocked yet, but you get the idea! This is our first Christmas together in our home and we are both so excited. Friday I also worked up an ornament wreath for the front door that was a super cheap DIY. 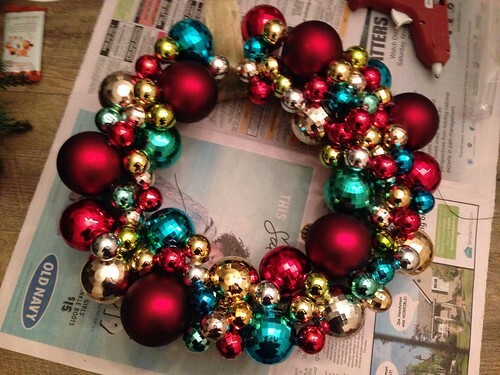 I already had a foam wreath form waiting to be crafted, and when running errands earlier in the day I picked up several tubes of disco ornaments from Target in the dollar bins. Whip out the hot glue gun, turn on some trash TV DVR’d episodes and pretty soon we have a handmade, unique front door wreath. So this Thanksgiving will be another first for us as we’re hosting our combined families. His family has never been big on Thanksgiving, although a cousin usually hosts something at their home and everyone comes over for football, xap xam (13 card poker – my game of choice, as you know), and poker. The food is usually Vietnamese and Chinese with a few American dishes thrown in. This year, both of our parents, his siblings and their family will be joining us at our home for my first-ever Thanksgiving meal. His parents are excited, but their go-to dishes aren’t American traditions, so we’re having a blended menu. I’m not crazy enough to cook the entire meal all by my lonesome, but I’ll walk through what we’re planning to have. Let me know if I am in fact crazy, and also what you’re planning to prepare or bring to a Vietnamese-American Thanksgiving feast! For the main event, I’m roasting the turkey with an herb-citrus butter rub between the skin and meat, stuffed with citrus, more herbs, some cut veggies and a little garlic. Hubs also wants ham. Not because we need it, but because he’s the host and wants it 🙂 For Vietnamese taste-buds we’re also picking up crispy pork from the local restaurant that catered our Dam Hoi. My absolute favorite dish on the Thanksgiving table – of the year, actually – is my Mother’s Oyster Dressing. My family is Southern, so it’s dressing not stuffing. Get it right. She bakes it in cast iron skillets until golden brown and crispy around the edges. Slather on giblet gravy and you’re in heaven. I always ask her to make an extra pan to take home for leftovers, it’s that good. This morning I saw Giada making a baked mashed potato + peas with some cheese and parmesan breadcrumb topping that looked pretty outstanding. Not sure if I’ll do that, but we’ll have some potatoes. Brussels Sprouts started making an appearance on my family’s Thanksgiving menu several years ago and I’ll probably roast up a smaller batch. The other vegetable things on the table will be stir-fried green beans (I know, not green bean casserole is blasphemy, but we’ll survive), and a Vietnamese Lotus Root Salad (Goi Ngo Sen – like this one). My Dad and I are usually the only ones who eat cranberry sauce, so I pick up one of the little cans from the store and also make a fresh version with orange zest for a little extra kick. Mom and Dad also like Sweet Potato Fluff, but I’ve never been a huge fan. They’ll probably bake a small pan and bring in case any of his family wants to sample. For dessert, I have several adult options ready to go, including some Boozy Fruit I canned last fall/winter. We’ll have the requisite Pumpkin Pie and fresh fruit to enjoy while we put up our inaugural Christmas tree with the family. While the family gathers and I’m busy in the kitchen, I’ll have out baked brie, charcuterie, Banh Pate So/Pate Chaud and Goi Cuon to snack on during the football games. So that’s a pretty good menu, no? I’d love to hear about your Thanksgiving family traditions! You have a lot of food! I love lotus root salad! Good way to cut the richness of your other traditional Thanksgiving dishes. I love the sauteed green beans vs the green bean casserole. Healthier option and a bit lighter than the traditional version. When I cook Thanksgiving I try to give a nod to living in the Mid-Atlantic, one to my family traditions, and one to Fall. This year I am cooking. I think I am making a mixed wild mushroom dressing this year. I’ve been wanting to do a good mushroom dish as a nod to Fall. I always have some kind of corn dish. My favorite is Paula Dean’s Corn Casserole. So easy and a big crowd pleaser especially with kids. I will be making an Italian style turkey with fresh rosemary, garlic, white wine, and pancetta. I’m doing sweet potatoes with toasted pecans. Mashed potatoes with poblano peppers (one of my guests is from the Southwest), steamed spinach to give some real vitamins to the meal and to help balance out the richness. This will be my first year doing sauteed brussel sprouts with prosciutto. I will also have a green salad with artichoke hearts, toasted goat cheese with a lemon vinaigrette. My sister makes a pumpkin cheesecake every year. She will be bringing it this year. I will add a pear and almond tart. All served with vanilla ice cream. I would like to weave in either a crab or oyster dish. In years past I have used my appetizers as a way to give a nod to either one of my heritages or to a culture I am exploring. I’ve done Thai appetizers, Middle Eastern, Italian, Greek, French and more. The big problem with doing that is there is so much to eat at the appetizer course that people don’t really eat the Thanksgiving dinner. This year, I am streamlining my appetizer course and putting more effort into the actual meal. I think you Thanksgiving will be hit! Just make sure to pace yourself and get others to help you. After all, the real point of the holiday is enjoying being together. Good luck!